You can find out detail instruction from LiveWeb - insert and view web pages real-time. 1. Extract the contents of the zip to a folder. 3. Click on Tools | Add-ins to bring up the add-ins window. 4. 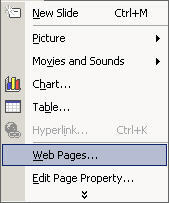 Click on Add to bring up the 'Add New PowerPoint Add-in' dialog box. 5. Navigate to the folder where the contents of the zip file was extracted and select 'LiveWeb.ppa' and click on OK.
6. You might be prompted with the macro virus warning. Enable the macros. When the Add-in is properly loaded, it will display a 'X' against the add-in name. 7. That's it. You have successfully loaded the add-in. Now put it to use. 2. Enter the list of web page address that you wish to create. 3. Provide the additional info required. 5. Run the slide show. 6. The web pages will be displayed during the slide show and refreshed at real-time. Note: If you cannot load an add-in in PPT2000 or later then check the macro settings (Tools | Macros | Security), if this is not set to at least Medium - the add-in won't load. 1. Select Tools | Macros | Security on the security level tab, check MEDIUM. 3. Now load the Add-in as per the instructions. I completely agree, great aricle! I’m glad I stumbled across this website! Very helpful thread. Thank you very much. One may also take help from Google..
You too can travel with our cheap flights to Kenya and witness this unique city of Nairobi. cheap flights to zimbabwe The word Nairobi came from the Masaai phrase EnlcareNyrobi which means cold water. Thank you for this beautiful information. SWF movie show step by step instructions to create java simulation with EJS.